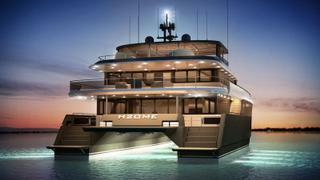 The first hull is expected to take 18-20 months to complete with subsequent builds talking 13-16 months. 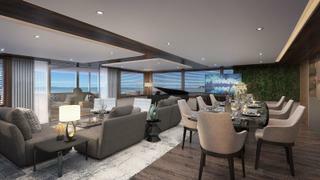 Newly-founded yacht builder Amasea Yachts has revealed the interior of its first 25 metre tri-deck catamaran concept. The builder used an event in Monaco to present the interior design and reveal more about its company strategy. The 25 metre tri-deck catamaran concept will be built in aluminium, with a reinforced hull and has been designed for long range cruising. It will be able to cross the Atlantic without refuelling, and has sufficient dry and cold storage to remain at sea for up to six weeks without re-provisioning. Unlike most multihulls, there's a third deck and a dedicated service area for the crew. This also allows more flexibility in terms of the layout. The master suite, for example, can be on the main or lower deck and the yacht is designed with two galleys: one for guest use and a smaller one for the crew. Speaking in Monaco, Amasea Yachts founder Jack Wijnants discussed the core tenets driving the design. “The whole story started with our own requirements that could not be met by composite builders. I decided to go back to the drawing board when I was in the market for a 20-25 metre catamaran to cruise the world but couldn’t find what I was looking for," he said. A transatlantic range and maximum privacy on board were key, Wijnants said. As a result, it is possible to operate the catamaran with just two people on board. "When I was looking at the market, I realised I couldn’t get the privacy I wanted. I had to share the galley with the crew which I didn’t like – I like to organise myself and I knew a lot of people have that problem," he said. Consequently, the crew and owner quarters have been kept completely separate on board to allow the owner maximum privacy. Wijnants also revealed that he is in the final stages of closing a deal with a Turkish shipyard where he hopes to build the hull and superstructure of the catamaran. He then intends to ship it to a yard in Italy or the Netherlands, depending on whether the owner wants "Dutch quality" or "Italian furnishings". Wijnants is not yet building on-spec but said the first hull will begin construction by the end of the year. It will then take 18-20 months to complete, with subsequent builds taking between 13 and 16 months and production limited to seven units per year. The new builder also unveiled plans for additional models. 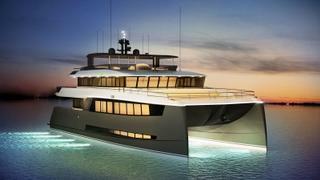 Amasea is also planning a 20 metre catamaran designed for the charter market and a monohull of an unspecified length.